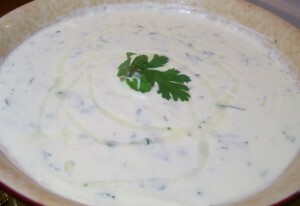 Thick Garlic Sauce recipe by Nazia Nazar at PakiRecipes.com. Remove the crust of the bread and soak in water for 10 minutes. Place the bread, garlic , salt , pepper and lemon juice or vinegar in a blender and puree to form a thick paste. Gradually work in the oil a little at a time to form a thick sauce. If the mixture appears too thick add water. The sauce should be of running consistency. The sharpness of the sauce depends on the amount of the garlic , from mild to really hot and burning. Serve this sauce with fried chicken , Roast Turkey and fish pakora.